I’ve been helping clients fix Google Autocomplete problems since 2012. I’m confident in saying I’m one of the most knowledgeable experts in the world when it comes to removing unwanted suggestions and predictions that appear after your personal or company name in Google, Bing, and Yahoo. Why Hire Me To Fix Google Autocomplete? Success rates – Although we can’t guarantee a fix, we’re successful in over 80% of the cases we take on. Deal with me – I’ve personally handled hundreds of Google autocomplete campaigns since 2012. I’ll be the expert quoting you and speaking with you about your campaign. Real searches – I believe natural looking search activity is the best way to influence the predictions we see in the search box. We don’t use automated tools, proxies, or public crowd source sites – all your searches are done by our private team. Honesty – I won’t BS you. I’ll tell you what to expect and how best to maintain long term positive results. Your online reputation is important and suggestions are the first thing people see when they Google you. Get a fast quote confidentially by filling out the form on this page. 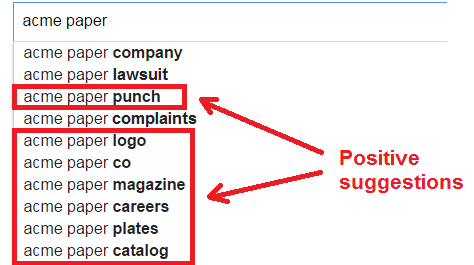 I have been helping clients take control of their branded Google Autocomplete suggestions since 2012. I consider myself to be an expert, inasmuch as I am doing my best to help manipulate an algorithm that’s been created by engineers who are much smarter than me. In my experience, we’ve had great success and we’ve also had failure. The thing I insist that all clients understand is that the predictions we see when we type in Google’s search box are put there by an algorithm. My job is to try to outsmart that algorithm, so that you don’t have to see unwanted suggestions like scam, lawsuit, arrest and other negative terms appearing after your personal or company name. We do everything we can to give you control of the suggestions, so that you can control your internet reputation. Below, I share everything I’ve learned over the years with regard to Autocomplete – for Google, Bing, and Yahoo. I will provide you with everything I’ve learned so that you best understand how the autocomplete algorithm works. Also, you will understand what you’re getting into and what may happen if you decide you want to hire me to help you fix problems you have with it. I promise to shoot you straight and give you my honest opinion on what you need to do to push out the unwanted suggestions and replace them with ones you want customers, patients, employers, and clients to see. Unlike Google “Searches Related To” that appear at the bottom of the search results after you perform a search, the suggestions in Google Autocomplete show up before you even perform the search. If you type your name or company name, you might see suggestions that appear after it – these are mostly positive – and they help us find what we want quicker. For example, typing a business name into Google might show suggestions such as facebook, contact, specials, hours, location, etc. Choosing a suggestion saves us typing time. Since the suggestions are a reflection of what other users have already searched for, the Google algorithm is “predicting” what we might want. 1 – I’ll ask for your keyword and the negatives. I can’t quote you without this. 2 – I use Google Keyword Planner to see what the average monthly search volume is for each of your negative suggestions. The keyword + negative with the highest monthly search volume is going to determine your price. 3 – I quote you a price which will include a 1-time setup fee plus monthly search activity. 4 – If you hire me, I’ll ask you to complete my credit card authorization. All payments are made by VISA/MasterCard. 5 – I’ll charge your setup fee and provide you with a list of recommend positive keywords we’ll search each month in order to get them to show and displace the unwanted one(s). You get to approve/edit the list. 6 – We begin searching those keywords for you each month from different computers. All searches are done by real people on home computers, laptops, phones, and other mobile devices. 7 – Your card is auto-debited on the same day each month. At the end of each month, we send you a screen shot. We expect to begin to see changes within 2-3 months and in some cases, your campaign may be complete and you can consider maintenance to keep the negative predictions from returning. We’re successful in 90% of cases we take on and once your case is fixed, we’ll recommend maintenance at the lowest possible price. You may cancel anytime with 30 days notice. I’m really easy to work with in this regard. Read the next section for a detailed description of how I setup an autocomplete campaign for success. Here’s the step-by-step procedure I follow when figuring out pricing and setup for any Google, Bing, or Yahoo Autocomplete Campaign. What keyword(s) are causing the negatives to appear? What are the negative suggestions? Which search engine (Google.com, Google.ca, Bing. Com, etc.)? Some new clients call me and don’t want to share their keyword – they just want a quote. I can’t give you an accurate quote unless you tell me your keyword and unwanted suggestions. Everything you tell me is confidential. Believe me, I talk to so many prospects, I have no desire (or memory) of a case unless we actually take it on. In the hypothetical example below, you can see that Acme Paper has two negatives showing – lawsuit and complaints. Each keyword is a separate campaign. You’ll see why later. Continuing my hypothetical conversation with Acme Paper, they tell me that they are also known as Acme Paper Company, so I check that keyword in Google, too. As you can see, scandal appears as a negative suggestion. The number of campaigns you need is determined by the number of branded terms (keywords) that have negative suggestions. The number of negative suggestions for each keyword has nothing to do with how many campaigns you need. If you only have one branded term with multiple negative suggestions, it’s still only one campaign. If Acme Paper Company had not shown any negative suggestions, then we’d only need the one campaign for Acme Paper. Of course, it is up to you to decide whether you want to tackle multiple campaigns at one time or take them one by one. Now that we know we’re looking at two separate autocomplete campaigns, it’s time to check the volume of each NEGATIVE keyword + suggestion. The estimates as shown below are an approximation of how many times each term is being searched each month by people in Google. As you can see, acme paper lawsuit and acme paper complaints have 0 monthly search volume. Acme paper company scandal is showing 40 searches per month. Now that we have the approximate average monthly search volume for the negative terms, I can determine how much search activity I want to create for each of my positive terms. For the Acme Paper campaign, there is no search volume for either negative term, so I would plan on searching the campaigns positive terms at an average of 25-50 times per month. I try to create a volume of search activity that looks natural to Google. I try to be careful not to set off any red flags that might cause one of our positive suggestions to get blacklisted and never appear. Search activity is what drives the cost of your campaign. Since I’m paying my team for every search they do, more searches cost more money, and I try to price your campaign as inexpensively as possible, while still getting a positive result. For the Acme Paper Company campaign, since Google Keyword Planner says there are 40 searches per month, I’ll make my quote based on 40-100 searches for each of our positive terms. In most cases, I create a list of 12 positive terms to be searched. I know that Google only shows 10 suggestions at most, so the two extra give us a bit of wiggle room in case every suggested term is not picked up by the algorithm. In some rare cases, I might suggest 15 or more positive terms and this is usually based on my gut feeling of what is needed for a successful campaign. To create the list of positive terms, I do research in Google looking for any suggestions that would help a user get what they want faster. For any suggestion I recommend, there must be published content on the web. Trying to get a suggestion to appear – and stick – for something that doesn’t exist is usually a waste of time. Existing positive suggestions that are showing. First, I take a look at the positive suggestions that are already appearing and select those, as we want to reinforce those terms. For our hypothetical Acme Paper campaign, I would probably choose these seven (7) positive suggestions, since they are already showing. I wouldn’t choose Acme paper company because that phrase is associated with the negative in our second campaign. It wouldn’t be the end of the world to choose Acme paper company as a positive, but I just wouldn’t do it – there’s no reason to play with fire on this. Existing queued suggestions. Queued suggestions are ones that are in the queue but not yet appearing. To see queued suggestions for your brand, simply type each letter of the alphabet after your brand name. In the screenshow below, you can see I’ve uncovered several new suggestions by typing Acme paper a. In most Google Autocomplete campaigns I’ve worked on, the more “queued” suggestions there are, the harder it is to manipulate and push out unwanted ones, but that doesn’t mean it can’t be done. I’d let the company know that on a campaign like, they are probably going to have to commit to long term positive search activity (12 months or longer) in order to try to get and maintain control of the predictions that appear after their keyword. Look at Google search results. In this case, I’m going to round out our list of 12 positive suggestions for the Acme paper campaign, by looking at the Google search results for Acme paper. Here I have everything I need to create additional positive terms. 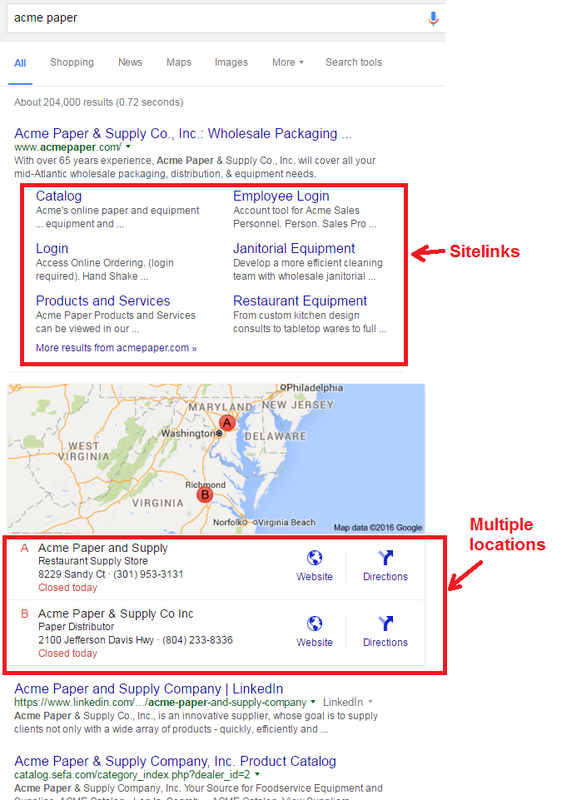 Sitelinks. First, the sitelinks are already showing up favored by Google. Since they are showing in search results, it tells me Google is more likely to show those as suggestions, as it would help a user get what they need faster. Remember – the whole mission of Google Autocomplete is to help you find what you need fast! Other Terms. Of course, any term is fair game as a suggestion – provided it helps you find what you want faster. Depending on your business, you might see specific products or services listed. Competitor Terms. You can also Google your competitors and see what suggestions are showing for them. Chances are pretty good that if you have relevant content on the web, the suggestions that appear for your competitor may also work for you. For our hypothetical case, I’d probably go with these 12 suggestions for the Acme paper campaign. It’s important to do a Google search for each of the positive terms, just to make sure there are no negative search results on page 1. A suggestion is no good to you if it leads to negative search results. After the client approves/edits the list of positive terms, we are ready to get to work creating natural looking search activity for each one of them. No. I can’t guarantee a solution because I do not control Google’s algorithm. Nor do I control the algorithms for Bing or Yahoo. We do our best to give you control, but since search engine autocomplete algorithms are always being updated, I can’t give you a guarantee. Sometimes, a client might see things looking good for several months and then things go haywire for a few months. Then we regain control. Being able to help you with your autocomplete problem is a big part of my annual revenue, so I’m always looking for ways to stay one step ahead of the engineers. It hurts my bottom line when we fail. We’re successful in 90% of the cases we take on. We have to do a good job with this work because a large portion of our business comes from referrals from other online reputation management companies. They will quickly lose faith and my business will dry up if we are unable to successfully get results. We move into maintenance mode after your case is fixed. I will quote you the lowest possible price I can in order to help you maintain control of autocomplete. Of course, even in maintenance mode, I can’t guarantee your negatives will never return, but our clients who commit to autocomplete for the long term get the best results. That’s because we are building sustained search activity for each of their positive keywords month after month. Think of it like an investment we are building: Each month, we strengthen each keyword by searching for it from a variety of unique IP addresses. As time goes on, it gets harder and harder to push those positive suggestions out. How long will I need to do maintenance? I recommend clients do maintenance until all of your negative suggestions are no longer queued. A “queued” suggestion is one that is not showing live, but is in the background, waiting to reappear. If your business is ABC Electric and the negative was “lawsuit,” we would type ABC Electric followed by the letter L into the search box. If we still see “lawsuit,” that suggestion is queued. If we don’t see it, it’s unqueued. Without maintenance, queued suggestions run about a 50/50 chance of returning (when your positive keyword searches stop, things might go back to where they were before). With maintenance, queued suggestions run about a 10% chance of returning. Unqueued suggestions run almost 0% chance of returning. That’s why we like to keep fending them off with maintenance until they are gone entirely. I usually tell clients to plan on at least 12 months of maintenance after their case is fixed. But each case is different. We can fix Bing and Yahoo autocomplete cases, too. We’re usually able to fix Bing pretty fast – faster than Google – but not always. Yahoo, for whatever reason, is much slower to fix, usually taking a few months longer than Google. The price varies depending on the search volume of your worst negative. Since we need to push out all of your negative suggestions, the one with highest average monthly search volume according to Google’s Keyword Planner is the one that is going to be toughest to push out. Your price is based on the amount of searches we need to do to push out the worst negative (and all the others with it). Creating positive keyword list – I research your keyword and come up with a list of positive suggestions I feel have an excellent chance of appearing after your name. I send you the list to approve/edit. 2. Monthly fee – The monthly fee I quote you covers the cost + my profit for the actual searches being done by our team. 3. Maintenance fee – Once we fix your issue, we recommend monthly maintenance which helps to guard against the negative(s) returning. Learn more about maintenance. In this Google Autocomplete Video Tutorial series, I share everything we’ve learned about manipulating Google Autocomplete to push out negative suggestions for online reputation management. How Often Do Suggestions Change? How Do Suggestions Get There In the First Place? Will Negative Suggestions Go Away Naturally? Can You Fix It Quickly? Google autocomplete – What is it and how can you change it ? How do negative suggestions get there in the first place? Google’s company line is that suggestions get there from content, search activity of users, and other factors. Low volume cases (people or brands with fewer than 10 suggestions showing) – In my experience, content can put suggestions there initially and when users search and click those suggestions, they get reinforced. Higher volume cases (people or brands with all 10 suggestions showing and several others queued) – In this case, I believe suggestions appear due solely to search activity. Some ORM firms speculate that suggestions come from other signals, such as links, click-through rates, and other factors. I don’t buy any of that. I believe if you can create enough natural looking search activity, you can fool the algorithm and displace negative suggestions with the ones that are being searched for. How do you push out unwanted suggestions? The way to push out unwanted suggestions is to create sufficient search volume for at least ten positive suggestions appended to your brand name or personal name. (We do at least 10 because Google generally shows 5-10 suggestions depending on the type of device you’re using. If we only searched for 2 positive terms, we might push your negative down to position #3. People would still see it. We do at least 10 in order to clean up the entire list). We do our best to create natural looking search activity. We don’t use bots, proxies, or public crowd source sites – they don’t work. All our searches are done by real people on real computers – whether it be a home desktop, smart phone with Wifi access or anything in between. We work hard to not leave any footprint or pattern an algorithm can detect. If we’re doing our job and all of our searches get counted by the engines, you’ll see your positive suggestions begin to appear and the negatives go away. Can you permanently remove a negative suggestion? We don’t remove terms. This is not what we do. If you want to explore moving suggestions, contact an attorney. I am not an attorney and cannot advise you on this. What we do is create natural looking search activity to “push out” negative predictions. Can I use Amazon’s Mechanical Turk or other crowd source sites to fix Google Autocomplete? Sure, you can try, but they probably won’t work. You’ll still find old blog posts on the web that expel the virtues of Mechanical Turk for manipulating autocomplete, they are OLD. I last successfully used MTurk in 2012. Then it stopped working, so I moved to MicroWorkers. That worked great for a while, then it stopped working by 2013. (Although I still see autocomplete jobs placed there by ORM firms who have no clue what they’re doing). Even aggregate crowd source sites like CrowdFlower which sources jobs to workers on a variety of different platforms don’t work. All of the public crowd source sites used to work at one time, but they don’t anymore. I have my theories on why, but it doesn’t really matter. The bottom line is they don’t work. Can I use VPN or proxy switching software to fix Google Autocomplete? Using proxy switching software to simulate a variety of different IP addresses will not work. HideMyAss and IPvanish are two such services I’ve used. They used to work. They don’t anymore. In fact, the first autocomplete campaign I ever did was using proxy switching. It worked great. That was in 2012. I wish it did work – it was a lot easier to manage and a lot cheaper to implement. Every once in a while, I test them out again, just to make sure. Will automated “bot” programs fix Google Autocomplete? Bots running in the background of PCs performing automated searches at random times will not work. A program is installed and runs in the background on thousands of different PCs. At random times it follows a set of instructions to simulate Google search. A program is installed and runs in the background of one PC. Combined with proxy switching software, it randomly performs searches from different IP addresses throughout the day. A colleague tested crowdsearch.me without success and I tested serpify.me without success. I mean no harm to the owners of these websites. Their software is not intended to solve problems with Autocomplete, I was just hoping they would, because it would be a lot easier than what I do. I also hired a developer to build my own software program with IP switching and another industry colleague I know has tried the same. None of it worked. He had no idea what he was talking about. You’re throwing your money away if you hire a reputation management firm without asking them exactly what they do. Can I fix the problem myself by searching for the same thing from my computer? Searching the same phrase from your computer over and over will not work. Can I fix Google suggestions myself? How would I do it? Here’s what you’d do. Start small. See if you can get one new suggestion to appear after your name or business name by searching for it in Google from a huge variety of IP addresses. Use multiple devices and Wifi connections. Search from the library, get friends and family to search from their homes. If you can get one positive term to appear, than you can probably get multiple terms. Remember, my experience tells me the predictions we see in autocomplete come from search activity from users. So, create that on your own and you might get a fix. If you do, let me know, I might want to work with you! Lower volume cases (where your worst negative has 0 avg monthly searches) are usually fixed in 2-3 months. Mid-level cases (where your worst negative has <100 avg monthly searches) are usually fixed in 3-6 months. High-volume cases (where your worst negative has 100+ avg monthly searches) are usually fixed in 6+ months. Can’t you fix it any faster? No. I’ve found the best approach is sustained monthly search volume. For one thing, it’s difficult for us to get enough variety of IP addresses. It’s not like we have a million people working with us. For another thing, a huge spike in search activity can appear unnatural and trip a filter with search engines. I understand a client’s need for speed, but my approach is to help you gain control of autocomplete for the long term. That’s how we do it. Do you offer a discount if we do campaigns on multiple search engines? I wish I could. Sorry, but each search engine has its own algorithm. 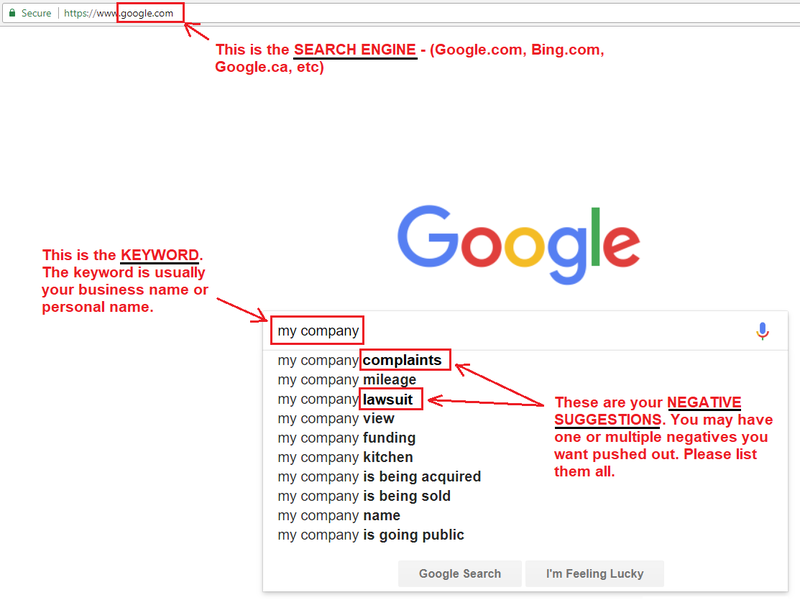 A completed search in Google doesn’t do anything to help your Bing or Yahoo campaign. Each campaign is separate. If you search for your brand keyword on each of the three search engines, you’ll probably see three different sets of suggestions. Each one is different. Can Google suggestions be different in different cities? Yes. We usually see different suggestions in different cities if a company has multiple locations or a high number of suggestions. It’s impossible for us to pinpoint a specific city, but usually we’re able to create enough search activity to push out unwanted predictions no matter where you’re located or what you’re seeing. Can you fix autocomplete problems in other countries? I feel confident we can fix problems in any country that uses the American alphabet to form its words. I’ve consulted with clients in Korea, India, and China and we’ve fixed cases that were in Spanish. How do you create natural looking search activity? What exactly are you doing? I could go into this a lot more, but honestly, I’m trying to stay a step ahead of search engine algorithms, so that’s all the detail I can give you on this site. We’re very good at what we do and I won’t take on a campaign unless I feel we can knock it out of the park for you. What is the impact of negative suggestions on companies and individuals? 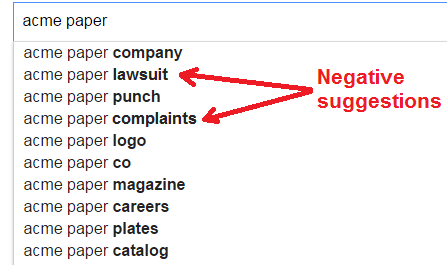 Like most negative press, the impact of unwanted suggestions in Google is hard to measure. You can use the Google Keyword Planner to get an estimate of how many people are searching for the negative phrase, but that’s only part of the story. You have no way of knowing how many of those people don’t do business with you or hire you because of it. How do you determine the keyword volume for negative suggestions? Go to Adwords and use the free Google Keyword Planner. You’ll need to be running a pay-per-click advertising campaign to get a good estimate. If you’re not running a PPC campaign or don’t want to, you can only get a broad range which isn’t really helpful. Are suggestions ranked in order of volume? In lower volume cases, yes, we generally see the predictions with the most amount of search activity ranking as the highest suggestions. With worldwide brands and companies who have hundreds of different queued suggestions, the suggestions are usually a bit more randomized. In other words, if you look at the average monthly search volume for the top 10 suggestions following the word “Pepsi,” you might notice that the 3rd of 4th suggestion down the list is the one with the highest search volume. Again, with lower volume cases, we typically see the predictions ranked in order of popularity. Google maintains a list of suggestions you will never see. These include racist, ethnic, sexual and pornographic terms. Can the suggestions just “fix” themselves naturally? Yes, that’s possible. If no one clicks on the negative and time goes by, your negative suggestion may disappear naturally. In the meantime, getting a quote from costs nothing and at least you’ll have something to consider. How often do the suggestions change? Google has two ways to change the suggestions that I’m aware of. 1 – Refresh – The first way is the usual refresh of all suggestions. Historically, these refreshes happen every 2-3 weeks. I know this because usually when one client’s suggestions update, they all update. This is usually a very happy day for me. 2 – News spike – When a famous person dies or gets arrested or something newsworthy happens that causes a huge surge in searches, we’ll notice suggestions change rapidly, within a few hours of the news. Then when the news dies down and people stop searching, the suggestions go away. This can happen in just a matter of days. Do you need to create more content to change google autocomplete? Most of the time, no. But some clients, especially individuals, don’t have much about them online. It helps to have some social media sites active because Facebook, Twitter, Linkedin, and Instagram are common suggestions we see. Also, a personal blog, website, hobbies, biography or some positive news or PR helps. We can help create content if needed, but most people already have plenty going on. If you have a common name, we can also piggyback on your namesake’s content. Most clients don’t care what suggestions appear, as long as they are not negative, so having a common name that others share can be very helpful. If they can’t or won’t tell you, you’re rolling the dice. We’ve fixed hundreds of cases by creating search activity that appears natural to search engines. Press them – if they are using any sort of automated software, proxy switching or crowd source sites, your campaign is probably going to be unsuccessful. No one can guarantee a result, but they should at least be able to give you an idea of success rates. We’re successful in about 90% of cases. Have you fixed a case like mine before? They probably won’t share a specific case, as most online reputation management clients require confidentiality; however, they should have some knowledge of the scope of work that’ll be involved in your case. I’ve turned down cases because I didn’t think we could fix them. I’ve also turned away referral business from agencies when Google has caught onto what we’re doing. I’ll always be honest with you about our chances for success. Algorithms are always changing and I’m always watching, trying to stay a step ahead. I’m not sure my competitors go to the lengths I do.